Kickboxer: Retaliation, a sequel to 2016's surprisingly good Kickboxer: Vengeance, opens with a conceit so ridiculous it's perfect for the revival of a Jean-Claude Van Damme martial arts classic. A year and a half after American fighter Kurt Sloane (Alain Moussi, a legit badass) defeated and killed his opponent Tong Po in an underground fight, he is arrested by Bangkok's finest and framed for murder. Whose murder? Tong Po's. Oh. In order to be set free and leave Thailand to resume his MMA career, not to mention be reunited with his wife (Sara Malakul Lane), he'll need to fight, and likely kill, another opponent in an unsanctioned fight. Durand: "He will kill you in a second. Death has its benefits. You will save a lots of expenses." Sloane: "I killed Tong Po." Durand: "Mongkut is 4-times Tong Po, Kurt!" So the script isn't great, but who expected it to be? Moussi still lacks charisma but he nails the action, while Van Damme is hilariously awful as the dismissive Durand. At least he's got cool shades, a stogie, and an outfit that makes him look like the Bangkok version of Jack Kerouac. Better is the fight choreography, which mixes up the standard issue kick-fests with some slick editing and a couple of extended battles cut to look as if they were done in a single tracking shot. A canal-side fight set to a remixed version of "Wipeout", finds Sloane testing his skills against a seemingly endless number of angry goons, and pulling some comical acrobatics (made funnier by the slo-mo editing) to make them look like clowns. There's a level of fan wish fulfillment that I, as a die-hard fan of the genre and of Van Damme, have come to appreciate. 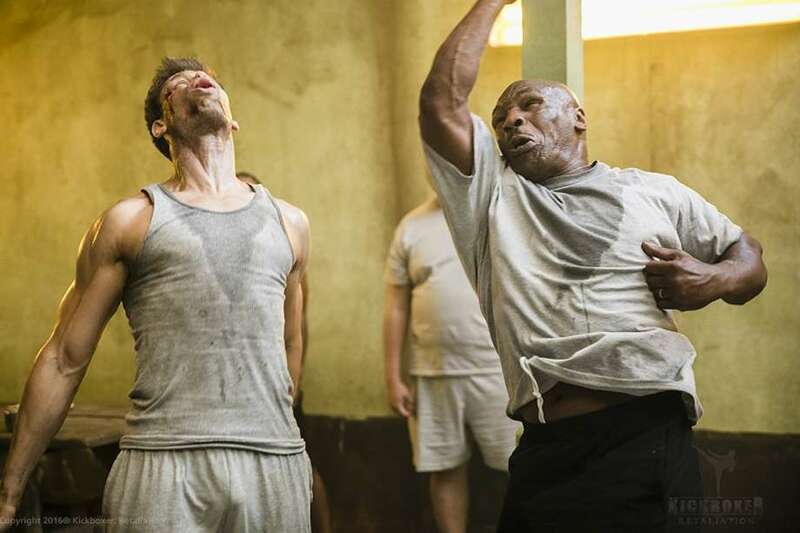 Mike Tyson, who seems to be better now in movies than he was in the final years of his boxing career, is faster and more devastating than ever as prison tough guy Briggs. He and Moussi have a brutal fight that sees Tyson landing body shot after body shot. It reminded me of his performance in Ip Man 3 opposite Donnie Yen. You can thank some clever camerawork, but still it's fun to see Tyson looking sharp again. We even get to see Tyson vs. Van Damme, which is pretty cool, plus Van Damme vs. Christopher "Highlander" Lambert as the crimelord pulling Mongkut's strings. Even the final fight, a 20+ minute bloody brawl between Sloane and Mongkut, harkens back to both Kickboxer and Bloodsport (find your opponent's weakness!!) while adding a few new wrinkles. When the fists are unclenched and, y'know, people start having to act Kickboxer: Retaliation is tough to endure. Fortunately, there isn't a lot of talking, anyway. Now excuse me while I wait anxiously over here for the upcoming sequel, Kickboxer: Syndicate. Bring it on.